Having been a Colts fan all my life, I can admittedly say you have caused me a lot of grief over the years. On Sunday night I left my house positive you had handed my team their first loss of the season. My wife can confirm my disappointment as I headed out the door mumbling about the sure outcome of the game. To travel from the front door of my place to my parents house takes no more than five minutes. In that short amount of time the infamous call came over your headset, and you went for it on fourth and two. I was absolutely floored when I walked through the door and saw my little brother in his Joseph Addai jersey jumping up and down yelling at the television. He was completely elated. I was shocked. Colts win. Isn’t it funny how many critics have come out of the woodwork to tell you how wrong you were? My work is full of armchair coaches who have done nothing but talk about your failed call from the moment they walked in on Monday morning. It seems as though every sports talking head has had something negative to say. I am truly amazed the negative attention you have received. It’s crazy how simply converting makes you look like a genius, but since you didn’t, you are a villain. This week must be a tough one. Who knows how much this is going to help coming from a Colts fan, but after watching the highlight for what seems the millionth time, I have to say I don’t blame you for the call. Take this with a grain of salt, but you actually have one armchair coach on your side. Have you ever watched nature videos of a lioness hunting her prey? When she comes across a herd of gazelle she takes her time to pick out the young and the weak of the group. She knows if she tries to chase one of the healthy strong animals she will tire quickly and may not get to eat. By finding the weakest parts of the herd, her chances for bringing down a gazelle increase greatly. You may not have been thinking about lions and gazelles in the game, but I think it illustrates the point clearly. With the Indianapolis defense struggling to stay ahead of injuries you had an opportunity to attack the weak part of the herd. All game long you had rookie corners going up against Randy Moss, one of the greatest receivers of our time. The defensive line was trying to plug holes with whomever they had available to stop your attack. Tom Brady kept finding the sick, weak, and young part of the herd. He continued to chase them all game long without showing any kind of fatigue. He was hungry and you were helping him go in for the kill. The only real problem you had was when Peyton Manning got the ball, and he kept coming, never ceasing. How many times have we seen Peyton Manning march down the field with even less time than what you would have given him by punting? Along with your very own Tom Brady, Peyton is one of the greatest quarterbacks of all time. Why would you give the ball to another lion when you are two yards away from taking down the weak gazelle? I think it is unfair to judge your instinct when taken into perspective. Unfortunately the rest of the herd circled the weak and stopped you short of your prize. 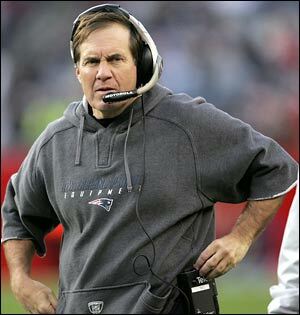 During all the years I have watched Patriots games on television I don’t think I have ever seen you look so angry. I am sure there were tons of emotions running through your body on the walk to the locker room. I wouldn’t have wanted to be a blade of turf under your feet as you stormed off the field let alone someone in your path. Saying you were disappointed is probably the understatement of the year. What a way to go out. For a moment I actually felt bad for you. I guess the whole point of this letter is to tell you personally I don’t think you deserve the beating you are taking. How can we be the ones to sit here and tell you how to do your job when most of us have never touched the sideline as a coach? It’s unfair and unfounded, especially given the fact you would have been hailed as a coaching genius if you had converted those two yards. Most coaches would have punted, but you took a chance with the situation you were in. I commend you for that. Keep your head up coach. I hope the rest of your season and your career aren’t defined by this moment. I want you to do well enough to get past this point, but not so well where we have to face you again. Make me the second arm chair coach that agrees with his decision. Great article. Way to go Bill. Thank you a Jets fan.